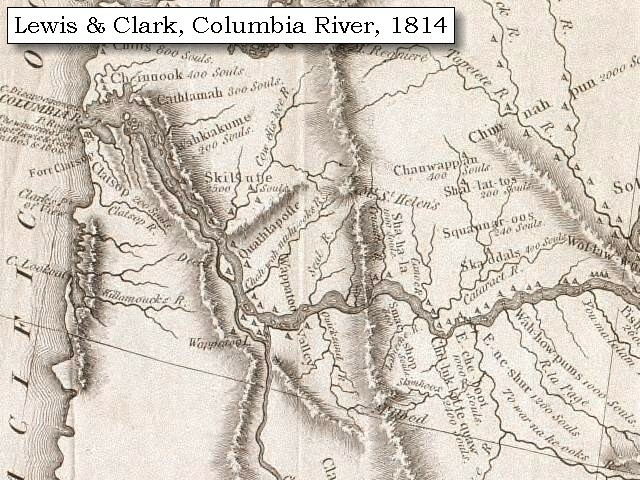 The Columbia River and its tributaries form the dominant water system in the Pacific Northwest. The mainstem of the Columbia rises in Columbia Lake in British Columbia, Canada. After flowing a path for 1,270 miles, the Columbia joins the Pacific Ocean near Astoria, Oregon. The major tributaries of the Columbia are the Kootenai, Flathead/Pend Oreille/Clark's Fork, Snake, and Willamette. The largest of these tributaries, the Snake, travels 1,038 miles from its source in Yellowstone National Park in Wyoming. The Snake River enters the Columbia at Columbia River Mile 325, near Pasco, Washington. 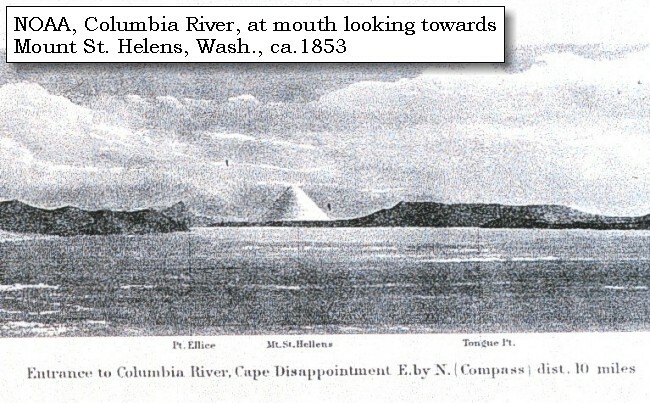 The earliest archaeological evidence of human habitation in the Columbia River Basin dates to 10,000 B.P. [Before Present Time] The earliest groups lived by fishing, hunting large mammals, and gathering plant foods. Cultures in the proto-historic and historic periods varied greatly along the river. On the lower Columbia groups lived in large multi-family long houses, while on the middle and upper river sections, people moved seasonally and lived in smaller groups. Native fishers took salmon at Willamette Falls on the Willamette River and at Kettle Falls on the upper Columbia. Celilo Falls on the middle river was the most important native fishery. Thousands gathered there during the spring and summer fish runs to harvest chinook salmon and trade. In the early 19th century, Pacific Fur Company trader Alexander Ross called Celilo "the great emporium or mart of the Columbia." 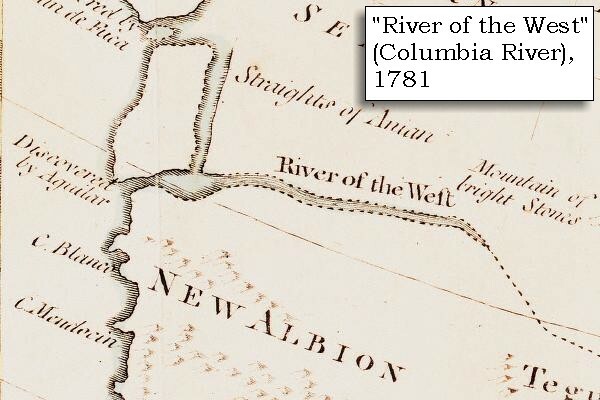 The Columbia River first appeared on European maps in the early 17th century as "River of the West," when a Spanish maritime explorer Martin de Auguilar located a major river near the 42nd parallel. 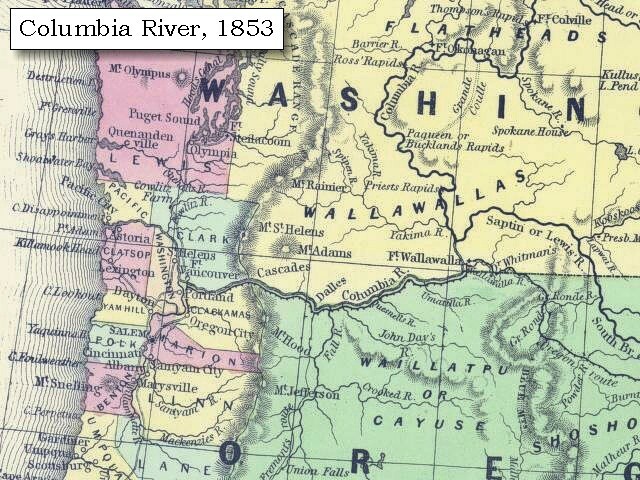 Cartographers often labeled the "River of the West" as an estuary to the mythical Straits of Anian, or the Northwest Passage and located it anywhere from the 42nd to the 50th parallel. In 1765, British Major Robert Rogers called the river "Ouragon" -- later spelled "Oregon" by Jonathan Carver in 1778 -- as a derivative name referring to the "ouisconsink" river in present-day Wisconsin. 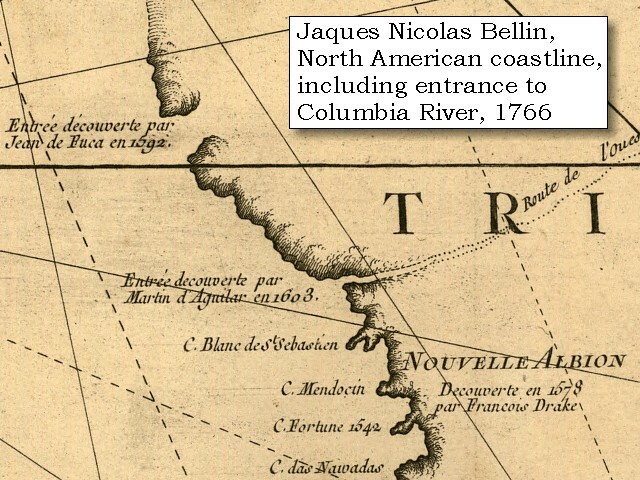 The first confirmation of its location came in 1775 when Bruno de Hezeta described a river estuary at the Columbia's correct latitude. 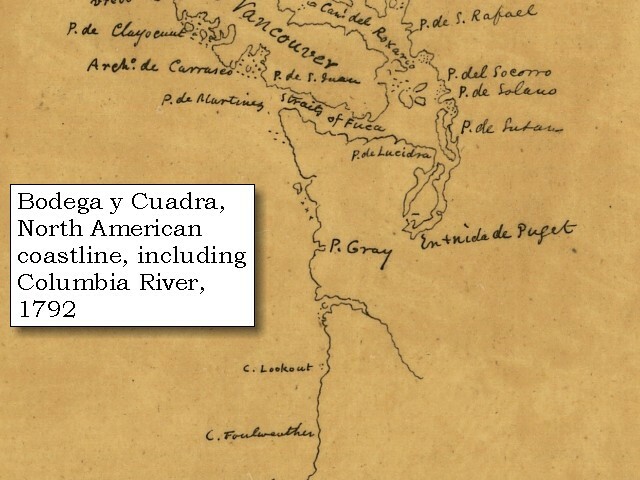 On May 12, 1792, the American Captain Robert Gray, became the first explorer to enter the Columbia River by crossing over the sandbar that blocked its mouth. Gray sailed about 20 miles up the estuary of the river, traded with the Indians for a few days, and then left after drawing a chart of the mouth of the river. 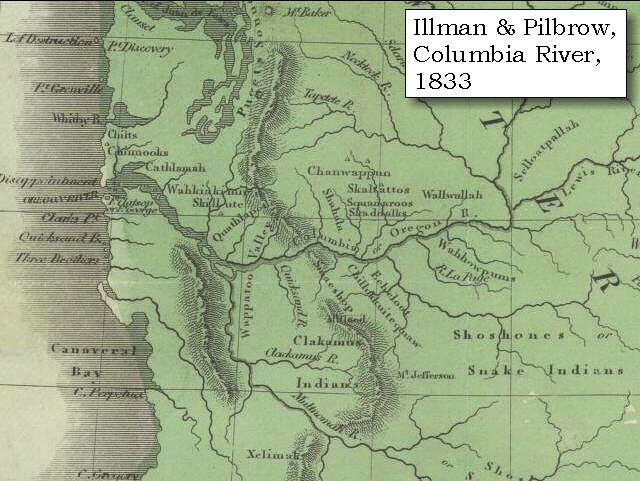 He named the river the Columbia after his ship, and claimed it for the United States. 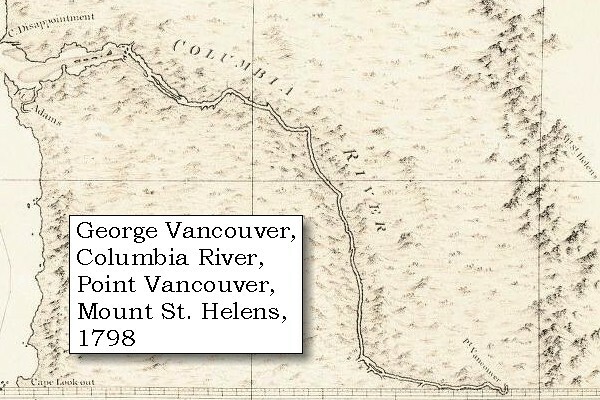 British Captain George Vancouver obtained a copy of Gray's chart from the Spanish governor at Nootka Sound and sailed to the mouth of the Columbia River in October 1792. He was unable to get his flagship Discovery over the sandbar, but Lt. William Robert Broughton succeeded with his smaller ship, the Chatham. Broughton advanced nearly 100 miles to a site opposite present-day Portland, Oregon, which he named Point Vancouver. To the east he saw a majestic mountain peak which he named Mount Hood. 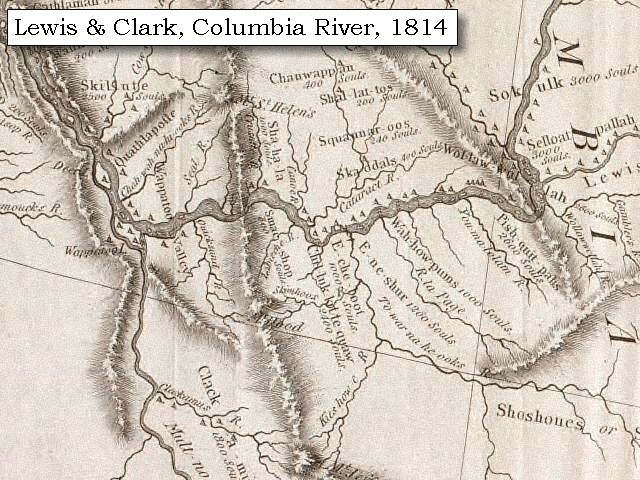 Meriwether Lewis and William Clark explored the river in 1805-1806 for the United States, and Northwest Company fur trader David Thompson made the first map of the full river in 1811-1812. 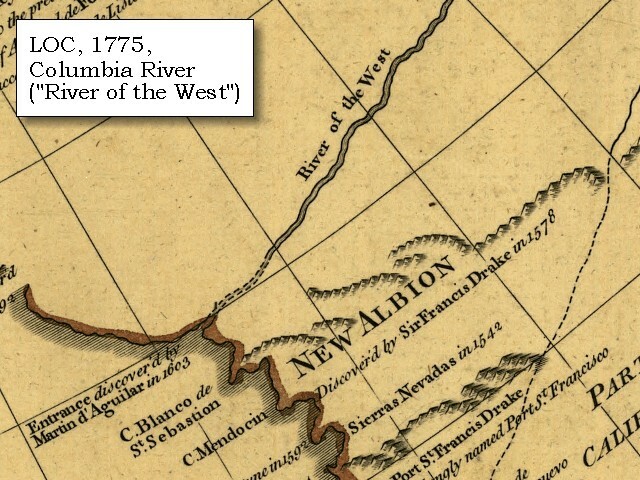 1766 Map, North American Coastline around the Columbia River (section of original). (Click to enlarge). Original Map: "L'hydrographie fran?oise : recueil des cartes g?n?rales et particuli?res qui ont ?te faites pour le service des vaisseaux du roy, par ordre des Ministres de la marine, depuis 1737, jusqu'en 1765", by Jacques Nicolas Bellin, Created/Published: Paris, 1766. Library of Congress American Memory Archives #G1059 B43 1772. 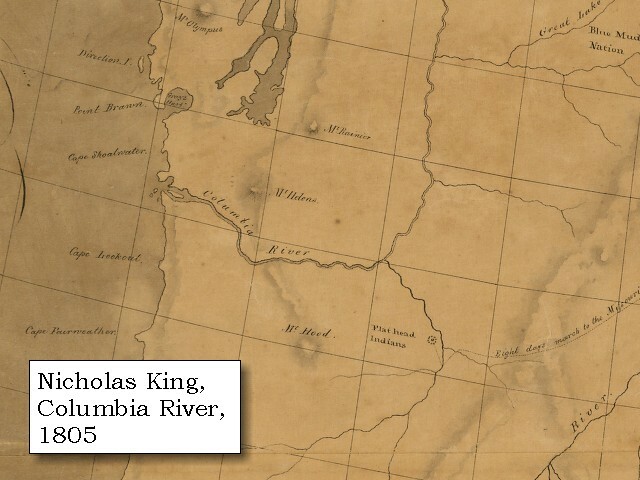 -- U.S. Library of Congress Archives, 2004, "American Memory"
1775 Map, North American Coastline around the Columbia River (section of original). (Click to enlarge). Original Map: The Russian discoveries from the map published by the Imperial Academy of St. Petersburg. Notes: "Printed for Robt. Sayer, Map and Printseller..." Library of Congress American Memory Archives #G7321.S12 1775 .R8 TIL Vault. 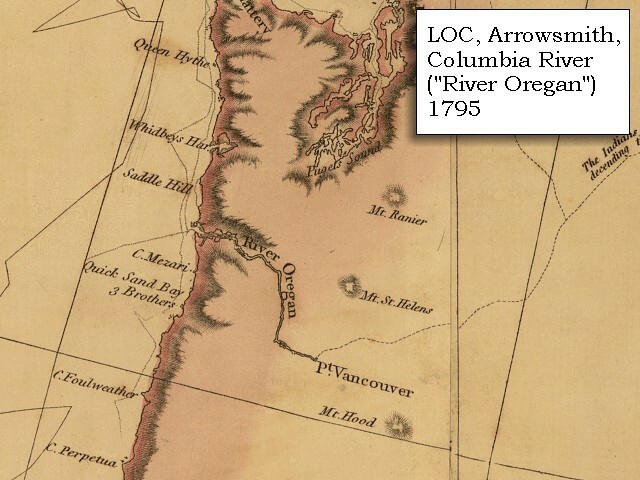 -- U.S. Library of Congress Archives, 2004, "American Memory"
1787 Map, North American Coastline around the Columbia River (section of original). (Click to enlarge). Includes Cape Disappointment as "C. de San Roque". 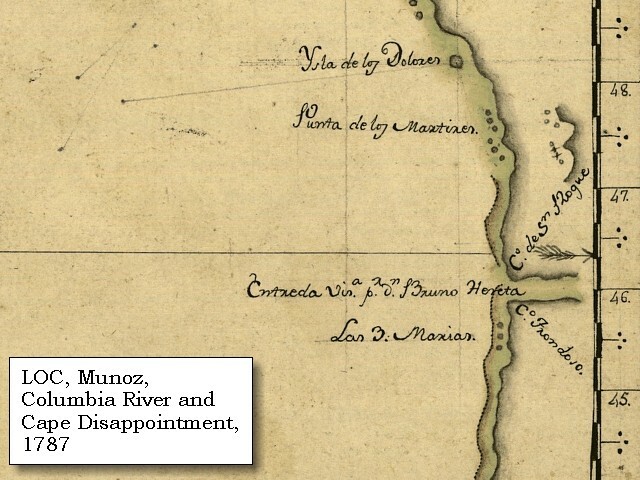 Original Map: "Carta que contiene parte de la costa de la California", by Bernabe Munoz, 1787. Scale ca.1:5,000,000. Library of Congress American Memory Archives #G4362.C6 1787 .M8 TIL Vault. 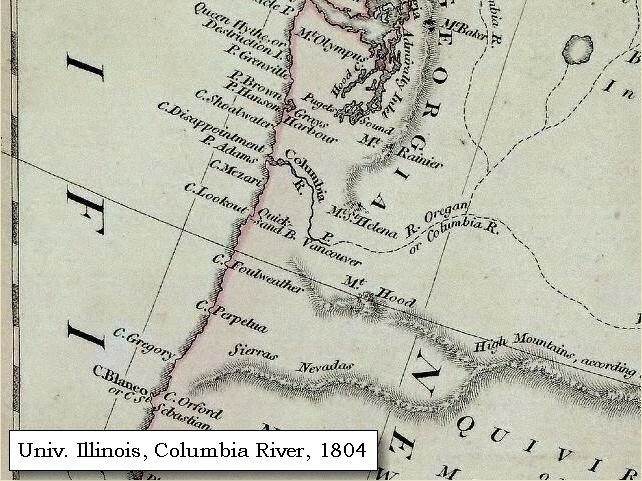 -- U.S. Library of Congress Archives, 2004, "American Memory"
1792 Map, North American Coastline around the Columbia River (section of original). (Click to enlarge). Original Map: Carta de los descrubrimientos hechos en la costa N.O. de la America Septentrional, by Juan de la Bodega y Cuadra, 1792. Notes: Pen-and-ink. Library of Congress American Memory Archives #G3350 1792 .B6 TIL Vault. -- U.S. Library of Congress Archives, 2004, "American Memory"
2003, Looking upstream at the Columbia River Gorge (Click to enlarge). 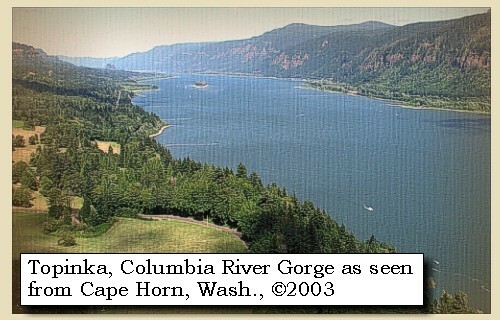 Image taken from Washington State Highway 14, at the Cape Horn Overlook. Copyright © 2003 Lyn Topinka, private archives, used with permission. 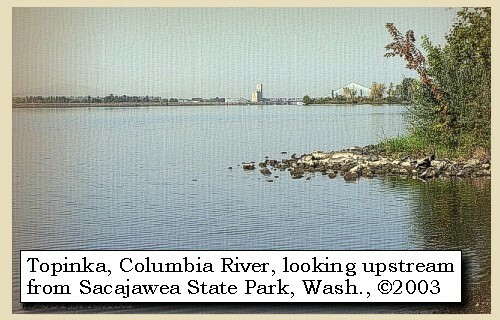 2003, Columbia River, from the junction of the Snake River with the Columbia River, looking upstream from Sacajawea State Park, Washington. (Click to enlarge). Lewis and Clark arrived at this junction on October 16, 1805. Copyright © 2003 Lyn Topinka, private archives, used with permission. -- Excerpts from: Center for Columbia River History Website, 2004, U.S. Army Corps of Engineers, 2002, and the University of Virginia Library Special Collections, 2002.